Scientists recently detected an organic sugar molecule that is directly linked to the origin of life, in a region of our galaxy where habitable planets could exist. Glycolaldehyde, the simplest of the monosaccharide sugars, can react with the substance propenal to form ribose, a central constituent of Ribonucleic acid (RNA), thought to be the central molecule in the origin of life. The international team of researchers, including a researcher at University College London (UCL), used the IRAM radio telescope in France to detect the molecule in a massive star forming region of space, some 26000 light years from Earth. Glycolaldehyde has previously only been detected towards the centre of our galaxy where conditions are extreme compared to the rest of the galaxy. 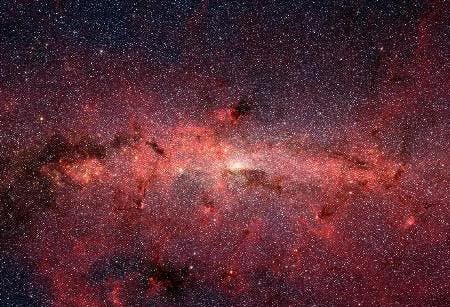 This new discovery, in an area far from the galactic centre, also suggests that the production of this key ingredient for life could be common throughout the galaxy. This is good news in our search for alien life, as a wide spread of the molecule improves the chances of it existing along side other molecules vital to life and in regions where Earth-like planets may exist. The team was able to detect glycolaldehyde by using the telescope to observe the region with high-angular resolution and at different wavelengths. The observations confirmed the presence of three lines of glycolaldegyde towards the most central part of the core of the region.